Please consider sharing your stories, memories, photos, artifacts, documents, etc. for inclusion in our digital galleries, or for preservation at the Jewish Heritage Center in Boston. Interested in donating physical documents or artifacts? Please print and use this form with your submission. The Jewish Historical Society of Western Massachusetts is a non-profit organization (501c3) whose goals are educational and cultural. 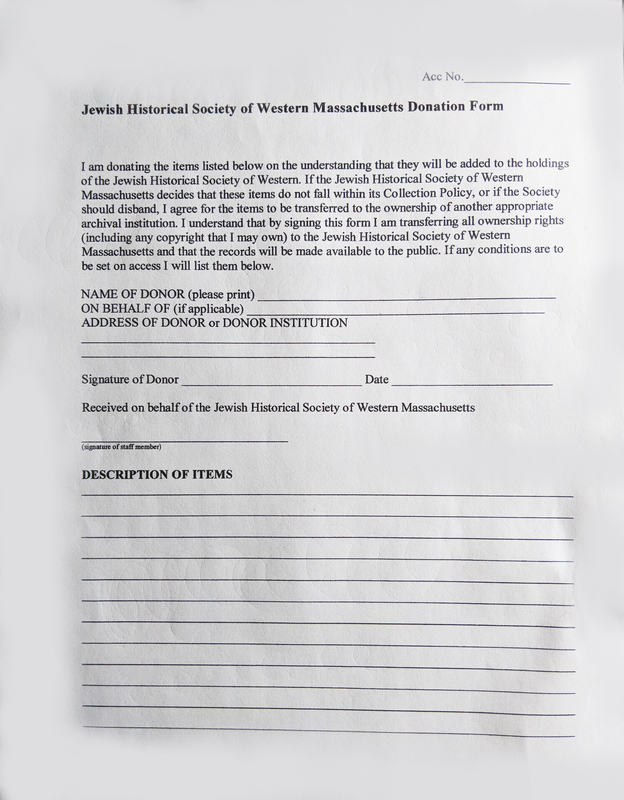 The society will provide a resource facility for research on Jewish life and activities in Western Massachusetts by collecting and archiving papers, photographs, tapes, ephemera and/or items of material culture related to the Jews of Western Massachusetts; and by recording oral histories and cultural events. The society will also work to enhance Jewish cultural life in Western Massachusetts through exhibitions, training opportunities, outreach, and other educational events.